It’s January again in our part of Scotland, but the suspended, withered state of the garden doesn’t bother me as much this year, for some reason. Maybe because, unlike the state of the world, I know the garden will get through this dark, cold time, without fail. This morning there is a scouring wind that’s shaking the absurdly tall stalks of last year’s delphiniums and the strappy brown leaves of the dead crocosmia, which are, I think, the only debris that really irritates me. I hate crocosmia out of all proportion: its invasive rhizomes, its cocky orange flowers. Maybe I’ve just gone off orange. But apart from those dead crocosmia, which I swear I will yank out today, I don’t mind seeing the dead pieces of last autumn’s perennials shake in the breeze. I know this means they’ll snap off with an easy crack, so I can do a quick bit of tidying as I pass through the garden without needing to run in for my clippers. I have a fantastic garrya elliptica I inherited which you can see in the top right of the photo above: its white tassels catch the breeze, like a wintry weeping willow. January 2017 is a difficult time for any thinking person on this planet, not just the 5 million who marched last week. But I’ve decided to take my cue from my resurging garden, and my absolute faith in it. It will get through this, and so will we. Yes, a tyrant is trying to hold hostage the country that raised me. But we live in a time when collective action has never been more possible, or more powerful. We will hold him accountable. And we will be unstoppable: a force of nature. I am hopeful. Because spring is coming. 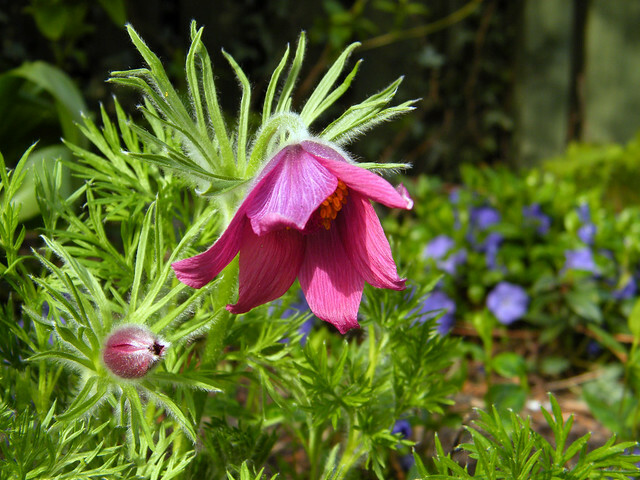 What reasons to be cheerful do you see in your garden? To keep in closer touch with what I’m up to, I’m tweeting at @sheilamaverbuch most days, and I’m also on Facebook and Instagram as @sheilamaverbuch, where I post pictures of my garden with greater regularity. Please come say hello! This is my bedroom window, with a 10-year-old clematis Polish Spirit (which I cut to the ground in early spring), morning glory “Grandpa Otts” and an oregano in the background, which you can’t make out too well but which thrills the bees. The clematis started out as a 9 cm plant from an offer in the Guardian newspaper; now it reliably grows to 8 foot high and 10 foot wide every year, provided I keep it watered. You might be able to make out the ladder in the upper corner, which is part of the scaffolding that’s now littered our garden for weeks as we get our old window frames repainted. Hardware aside, I’m thrilled with this corner of the garden. The clematis lives in a huge stone-built planter which is open at ground level. I like to imagine the clematis digging its roots way, way down. I have an old gardening book called GARDENING IN A SMALL SPACE, and I remember the author, Lance Hattatt, said the mark of an advanced gardener was someone who could control their use of colour. I swore to myself I’d one day have a corner of the garden with a limited colour palatte, and I see what he means now: there are splashes of yellow and some salmon in with the purple planting during other months of the year, but during late summer, it’s purple only, and this area feels cooler, more restful. The only problem is getting out of bed in August and September: I can see the clematis when I’m propped up on pillows in bed, and I’d rather gaze at those purple stars than do just about anything else. My book-writing carries on; it’s garden-y, as I mentioned before. At the moment I’m trying to find out whether delphiniums which are cut to the ground in July will flower again in September –in Scotland–. If you have a garden in Scotland and have successfully coaxed them into flower again in September, can you let me know? I don’t want to include that as a detail in the story if it’s not accurate. If it turns out to be unlikely in my corner of East Lothian, I’ll swap the flowers out for hollyhocks in that critical chapter. What’s going on in your garden this month? PS – if you want to keep in closer touch with what I’m up to, I’m tweeting at @sheilamaverbuch most days, and I’m also on Facebook and Instagram as sheilamaverbuch, where I’m posting pictures of my garden with greater regularity. The abundance of May slightly takes me by surprise every year. So much of the greenery that strikes my eye, from the herbaceous peonies to the delphiniums, was invisible in January, but now it is all part of the greenscape that makes the May garden seethe with life. This week in the podcast I’m appreciating how well white flowering spring bulbs look up against all those greens, including the unusual white bluebells that grow in this garden, as well as leucojum (the summer snowflake). In this episode I’m also looking at a few new sponsors for my charity plant sale on 24 May – including David Austin Roses (donating a raffle prize of a cut roses bouquet), Macplants, and Binny Plants – and I’m giving a brief rundown on the water feature I’m planning in the corner of this small garden. Do you have a water feature in your garden? I thought and dreamed about one for years, but I could never find components that wouldn’t look twee or cost a fortune. I have finally found a stone-effect trough that is convincing to my eye, along with a classy wall-mounted fountain spout from Haddonstone. I’ll keep you posted as and when I get it installed, if I figure out how to make all the pieces work together. What are you doing in your garden this week? Want to subscribe automatically to the podcast to hear it on your mobile device? Go to Stitcher and learn more about downloading the app. In this episode I’m looking at the delphiniums that are growing like wildfire and planning how to get bigger blooms this July. The resurgence of growth in the April garden is magnificent. 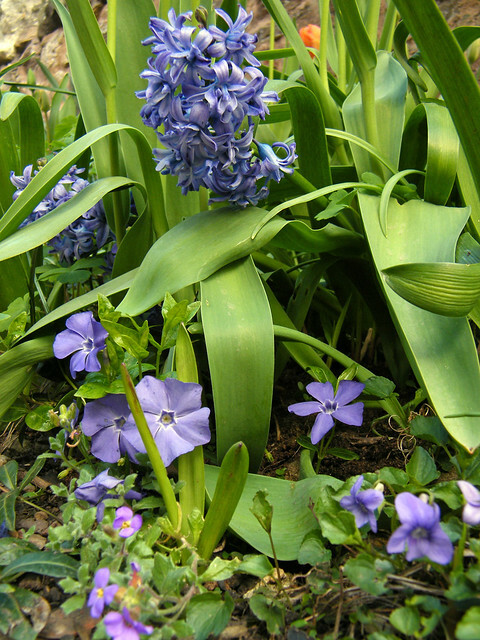 But as welcome as spring bulbs are, they can make for a patchy looking landscape. Pulsatilla vulgaris and vinca minor: The fantastically fuzzy buds of pulsatilla are marvelous in late March and early April. The out-of-focus blue in the background is the ground-hugging vinca minor: this periwinkle is much easier to manage in a garden than its big brother, the greater periwinkle vinca major. Some gardeners will warn you away from any periwinkle as too invasive, but this is quite manageable in my garden and flowers profusely in April if I cut it back hard in autumn. 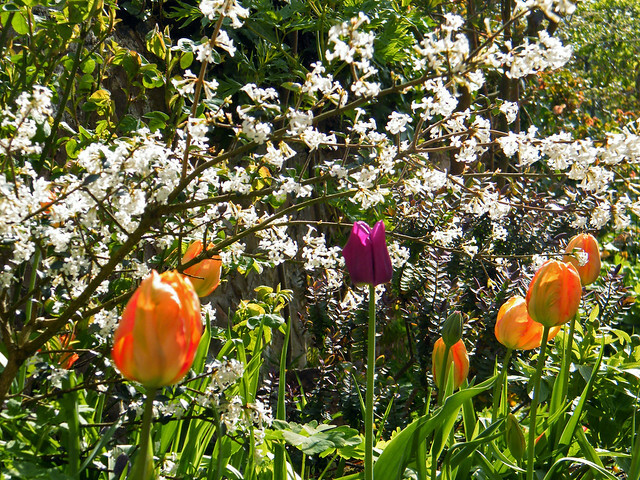 Osmanthus delvayii above plain and parrot tulips: This very slow growing shrub is a froth of white for a few weeks in April, and the way it spreads its arms over the tulips reminds me of a tiny flowering cherry tree. Its heavenly, lily of the valley-like scent is fresh and clean, never overpowering. Not to be confused with Osmanthus burkwoodii, which has bigger leaves and smells like toilet duck. The tulips shown here are purple Passionale and the orange parrot, Professor Rontgen, but any pair of contrasting colours would look good. next to bulbs and can help disguise their dying leaves. 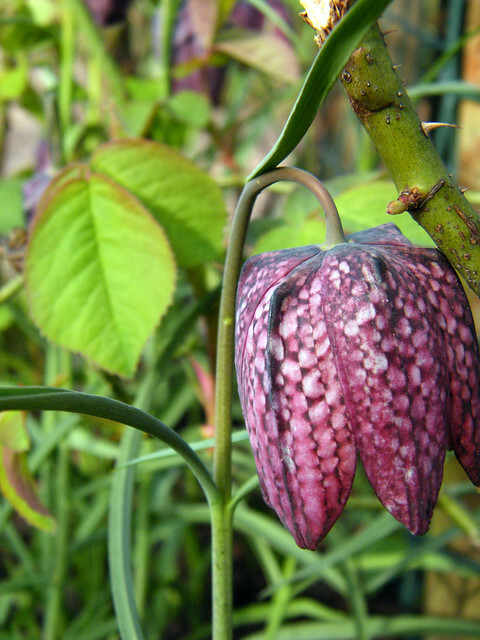 Try to plant the snakeshead where you will see the sun coming through it, so it lights up like an elaborate checked lampshade: otherwise it can look like a dirty purple. I like the white version of the snakeshead even better, and it’s fairly easy to grow from seed; if you can wait a few years they’ll reach flowering size and you can fill a corner of your garden with these elegant little bulbs. 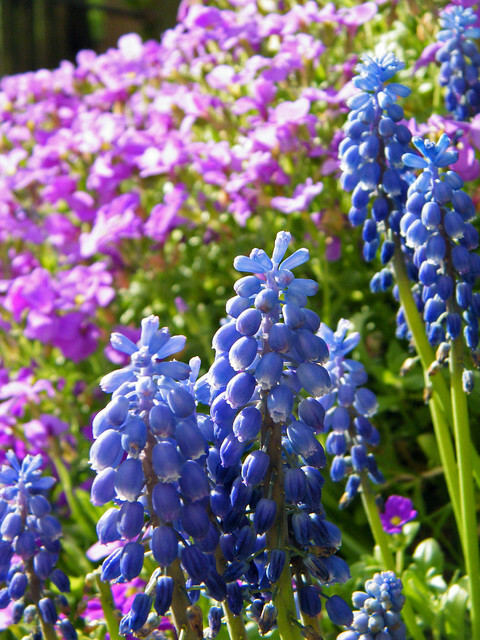 Grape hyacinths with aubretia: Someone else mentioned this combination and I’m so glad I tried it. The muscari hold their heads above the aubretia, which is that fabulous rockery plant that spills its purpleish flowers over stone walls. “We should get more of that,” was my husband’s one and only comment about the aubretia last year. He doesn’t usually say much, so that means something. If you don’t want to find the grape hyacinth appearing all over your garden, snip off the flower heads before they go to seed. Hyacinth with wild violet, aubretia and vinca minor: I’m not a great fan of monochrome schemes, but this one sowed itself and was winking at me from the border as I was thinking about this blog post, so I had to mention it. I recall wanting an all-blue border at a certain stage in my gardening life, but I got over it. What I won’t show you today is a picture of my raised bed, which has eight lovely broad bean plants and eight plastic milk bottles (these bottles are God’s gift to the vegetable gardener who needs a cloche or drip tray. I also plant a punctured or bottomless milk bottle next to new shrubs, to give them a good 2-litre drink when I water.) This time, the bottles are covering baby beets and lettuce. This is why I was saying last year that I wanted to keep my new vegetable patch in a bit of the garden I don’t see from the window: I hate the plastic, fleece, netting and so forth that vegetable growing so often demands. But I’d like my seedlings to survive, so I’ve rolled out the plastic. Like the hosta halos and wire plant supports that have now disappeared beneath the delphinium foliage, the cloches won’t be eyesores for long; they should be unnecessary in a few weeks, when the frost danger has passed. What are your favourite planting combinations in your garden? I’d love some more ideas.